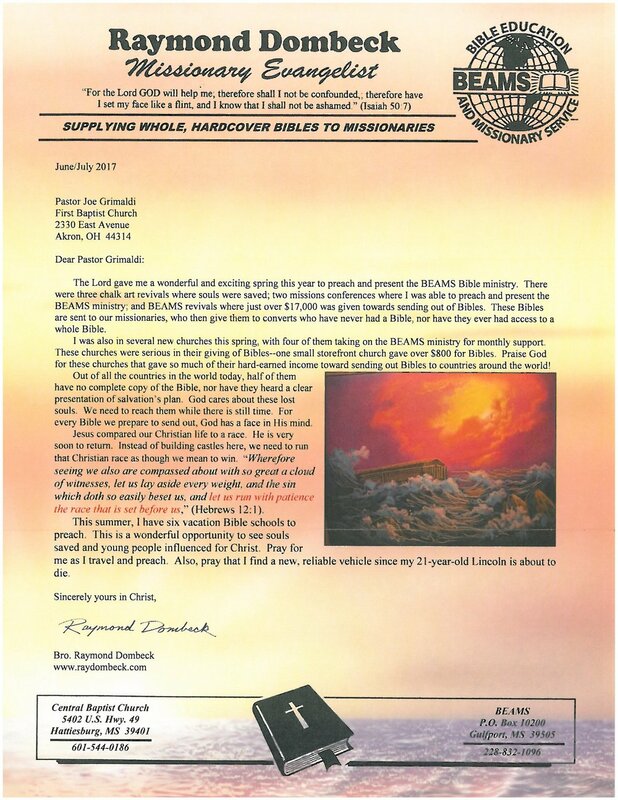 Brother Ray is a valued member of the BEAMS Missionary Ministry in assisting the cause of supplying whole Bibles to missionaries around the world. He is serious about preaching the Word of God, seeing souls saved, and influencing people for Christ. He has been effective on mission fields throughout the world in reaching thousands with the life-changing message of the Gospel. The Goal of BEAMS is to provide complete hard cover Bibles free of charge to missionaries. The primary purpose of BEAMS is to raise funds through offerings from local Bible believing Baptist churches for the printing and distribution of these Bibles to missionaries in need. Presently, the BEAMS ministry is serving 2,000 missionaries and national workers in 123 countries. 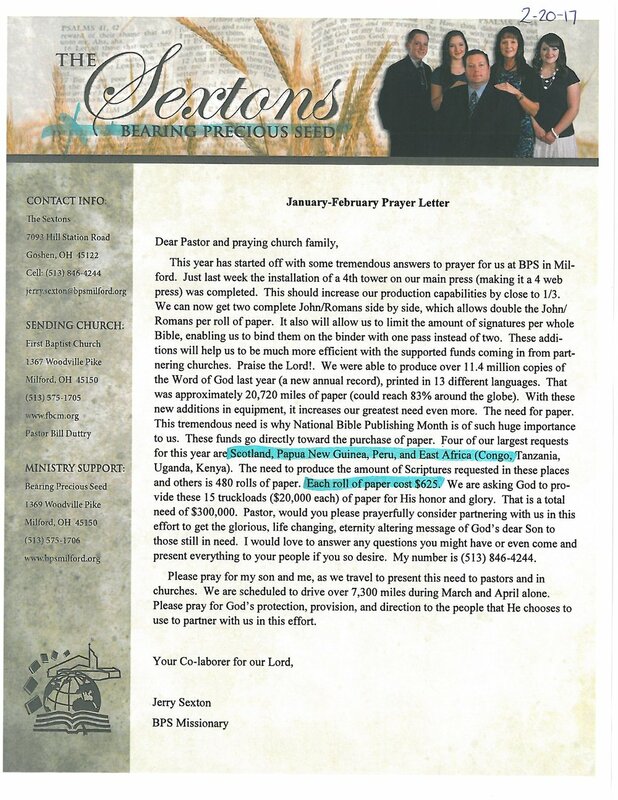 The BEAMS ministry is sending out 10,000 whole hard cover Bibles per month in 24 languages. Bro. Ray is also a chalk artist. His illustrated chalk sermons are designed to produce a lasting impact on the listeners, as people will retain more of what they see than what they hear. The chalk art service provides an excellent opportunity for attracting unsaved visitors to church, who normally would not come. Their Purpose: The Bible gives every Christian the responsibility to take the Gospel to the whole world. God has ordained the local church to carry out His Great Commission. 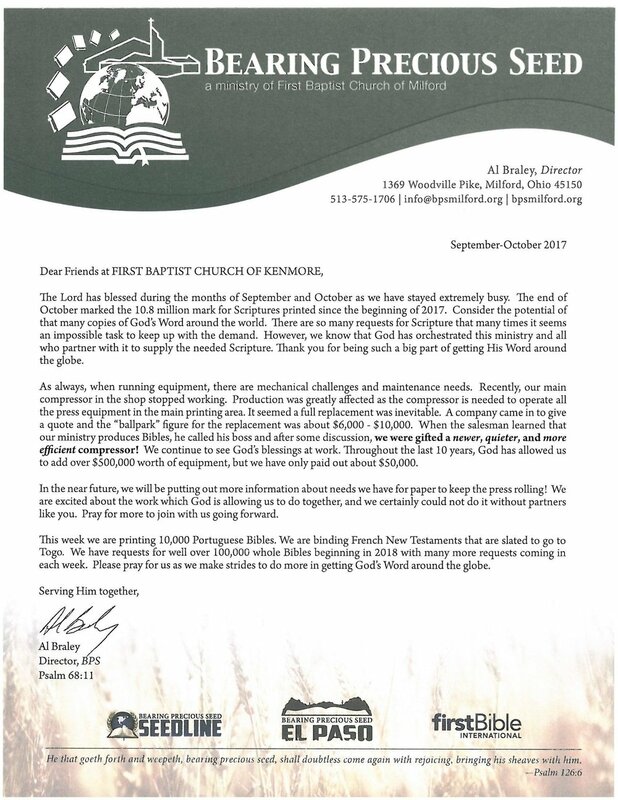 The Fellowship Tract League is a local church ministry of the Fellowship Baptist Church in Lebanon, Ohio. 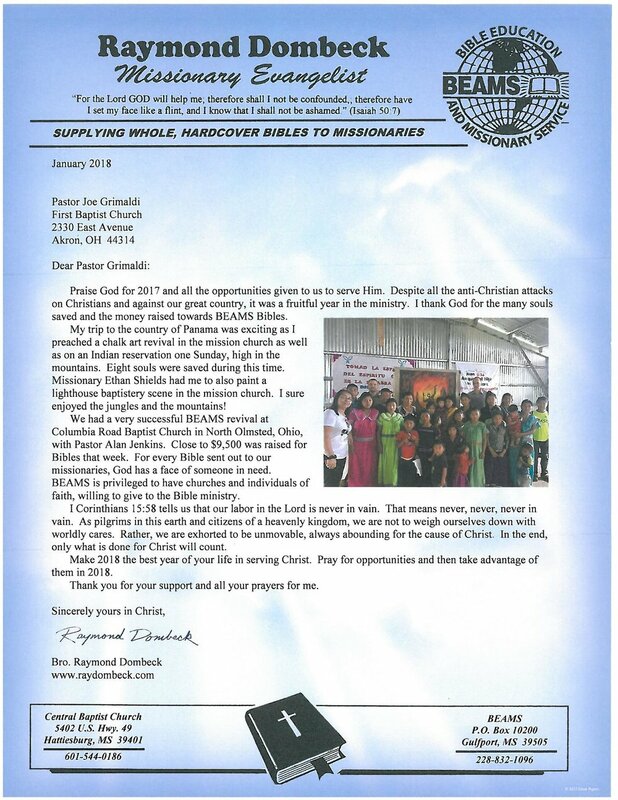 They believe the world can be reached for Christ through the printed page. Their purpose is to provide the material that is needed for God's people all around the world to fulfill His command. 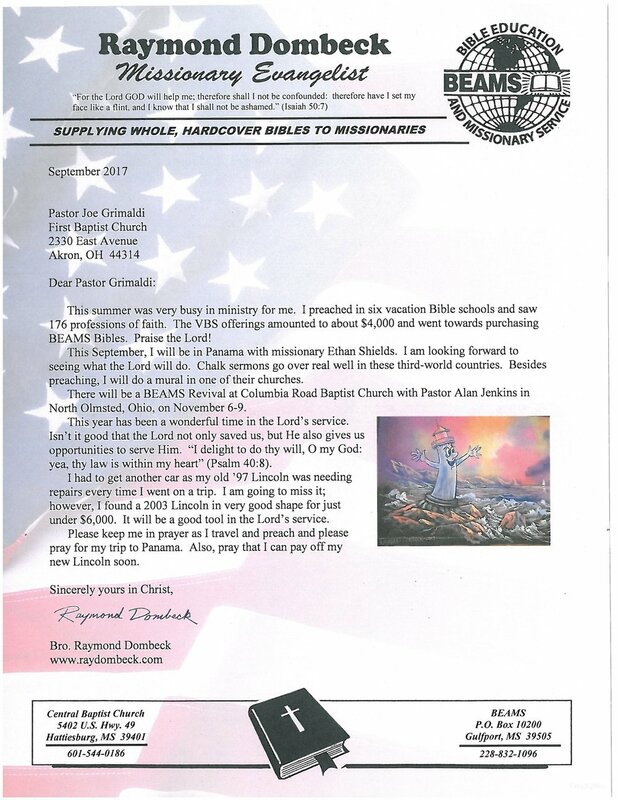 Their Production: Since the ministry began in 1978, the Lord has allowed them to print and ship over 4 billion Gospel tracts into more than 200 countries. Every tract printed by this ministry has been given away free of charge. At the present time, they are printing in over 85 different languages. The Fellowship Tract League began operation in one room of the Fellowship Baptist Church's basement with a single sheet-fed press. The ministry now occupies a separate 16,300 square foot building, and operates two presses. Their newest press is capable of printing in full-color, and prints twice as many tracts per hour as the presses they had in the past. The building and equipment are debt free! To God be the Glory! 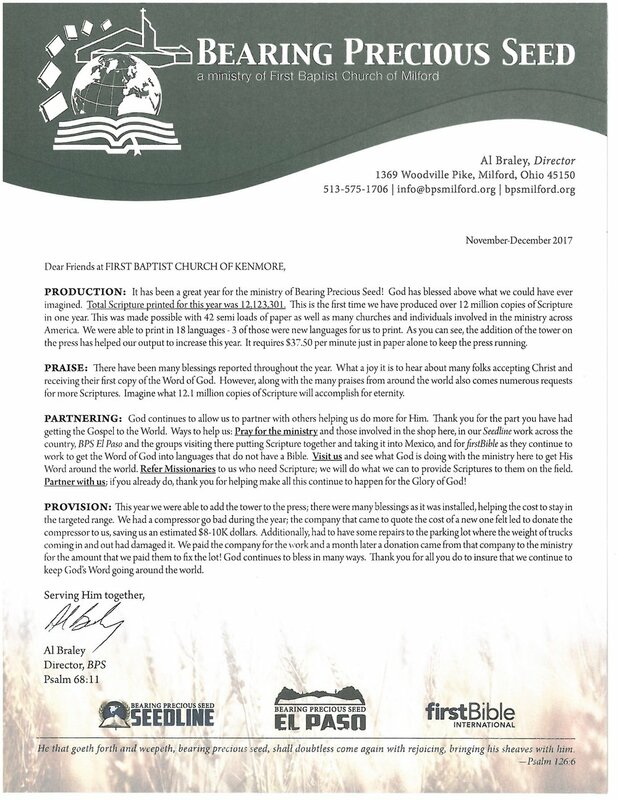 The Grace Baptist Church under the leadership of Pastor Mark Hiltibidal is privileged to have a ministry of preparing the printed Word of God for the mission field. Every Tuesday evening at 5:30pm church members meet to collate, staple, cut, and box Scriptures. Hundreds of books of John and Romans in several different languages are sent to the mission field for distribution. 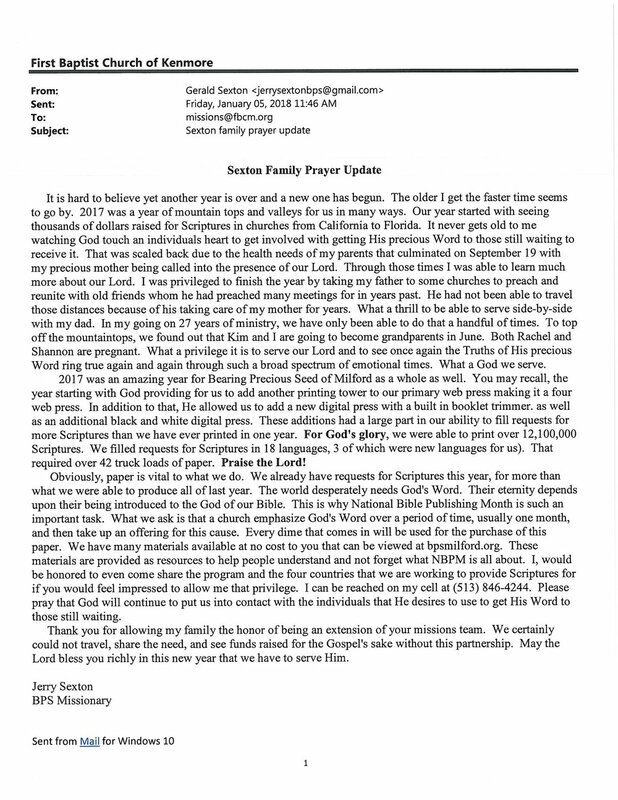 In the past eight years they have sent out more then 800,000 Scriptures to the mission field. - I John 1:1 "That which was from the beginning, which we have heard, which we have seen with our eyes, which we have looked upon, and our hands have handled, of the Word of life;". Bro. Sexton is a representative for Bearing Precious Seed based out of Milford, OH. Over 150 million copies of the Word of God has rolled off of the presses at BPS. 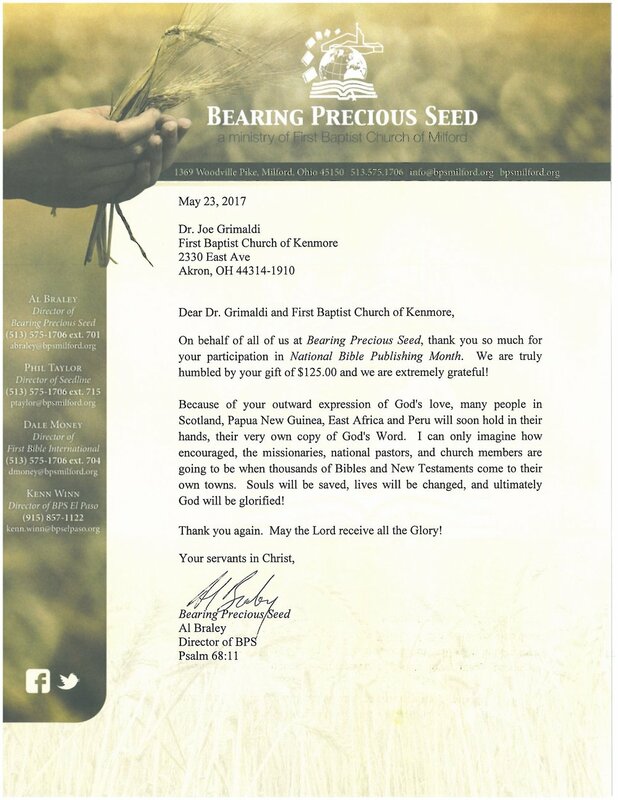 Bearing Precious Seed is actively printing in over 50 languages and partnering with missionaries in over 115 countries around the world. As God blesses and His people continue to support the ministry, millions more Scriptures will be published and untold numbers of lives will be changed. Bro. Sexton's life work is centered around making sure every person around the world is able to hear the Gospel story through the pages of a Bible in his or her own language.